A collaboration between Austrian composer Klaus Lang and the ensemble Golden Fur (Samuel Dunscombe, Judith Hamann & James Rushford). ‘Beissel’ uses music by the eighteenth century Baptist leader Johann Conrad Beissel, who developed his own compositional system which he said was given to him by angels, and which has been described as a very early pre-cursor of serialism. 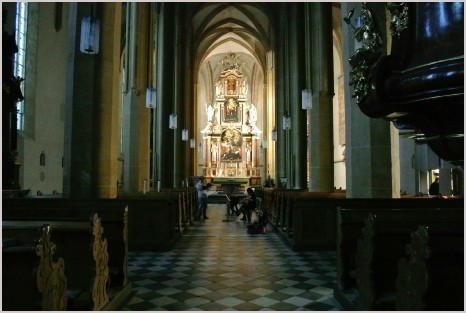 Recorded at the abbey at St Lambrecht near Styria in Austria. How did your collaboration with Klaus Lang come about? 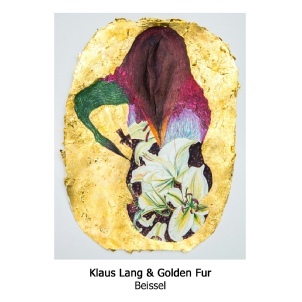 James Rushford: Golden Fur has followed Klaus' work since we formed in 2008. We actually did an Australian premiere of his 'Der Weg Des Prinzen I' in 2009, and have also played much of his repertoire individually/with separate ensembles (I know Judith has played some strong pieces in Mexico, and Sam did a version of 'Hungrige Sterne' at Tectonics Festival in 2015). I was also invited to collaborate with Klaus as a duo for Tectonics New York back in 2014. 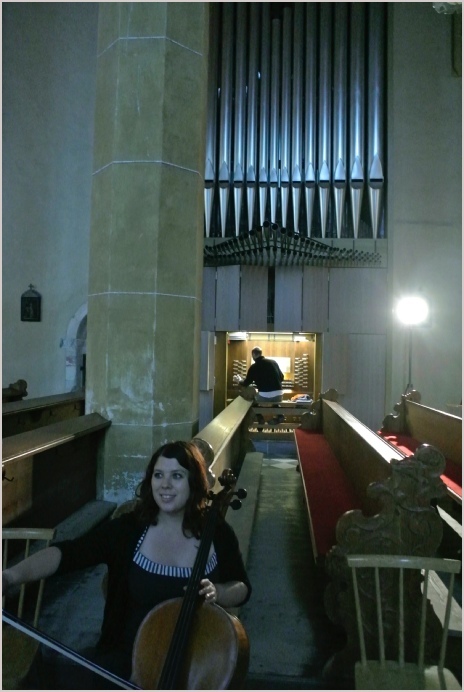 We made a funny fragmentary piece made up of duets on harmonium, clavichord and viola. We've always wanted to work with Klaus as improvisers and interpreters. We reached out to him whilst on residence at Cité des Arts in Paris 2016, and he was very generous to invite us to stay with him in the Austrian Alps for a few days. There was no fixed plan to compose or record anything, but after playing together each day, the idea for the Beissel piece slowly formed. Klaus has access to this wonderful monastery (St. Lambrecht), so we took the opportunity to record there. And how did Golden Fur come about? What has the trio done before this? Judith Hamann: Golden Fur is a trio which began in 2008 while we were undertaking our Masters degrees together in Australia. Originally focused on performing new or rarely heard compositions, the ensemble started out with a run of concert series which unfolded over several years. During this phase of the group we commissioned many new works by Australian artists, alongside presenting the Australian premieres of works by international composers (including Klaus). Golden Fur have performed at festivals including Tectonics (Athens and Tel Aviv), Supersense Festival of Ecstatic Music (Melbourne), Liquid Architecture (Australia), and for the Monday Evening Concerts (Los Angeles) to name just a few. The group have also been artists in residence at The Recollets (Paris) and Cité Internationale des Arts (Paris). Over time and various configurations of geography the aims and interests of the project have changed (all three of us lived in southern California for some years). While Golden Fur still occasionally perform notated music, the group now primarily works on collectively composed, or collaborative projects with other artists. Currently in the works is a project with writer Dennis Cooper and film maker Zac Farley, as well as partially composed, partially improvised works for cello, clarinet and keyboard instruments composed in the studio or presented live. What was your interest in Johann Conrad Beissel’s music, and how did you use Beissel's music in the piece, and w What was your interest in Johann Conrad Beissel's music, and how is it used in the piece? Samuel Dunscombe: Our interest in Beissel’s music came through Klaus, originally. He had recently returned from a trip to the USA where he had visited Ephrata, which Beissel founded as an experimental religious community of Seventh Day Dunkers in 1732. Beissel’s story is utterly weird, and utterly compelling. Ephrata was sort of an early utopian community organised on semi-socialist principles, where all members were to maintain a strict vegetarian diet, celibacy was encouraged (though not required), and upon joining all were required to adopt a new name (Beissel himself became “Friedsam Gottrecht” - Peaceful God’s Justice). Music was at the heart of everyone’s life in Ephrata, and the hymns were all composed by Beissel himself, who had developed an algorithmic system for translating bible text into music. I guess what attracted us to the Beissel story was firstly the unique (and slightly batty) nature of the community at Ephrata, and secondly the weirdness of Beissel’s music itself. Beissel’s rigid compositional process makes for music that is both beautiful, and strangely disjointed and asymmetrical, with a beautiful sort of naivety to the whole thing. I think the three of us are quite attracted to things that are somehow a little strange, out of the ordinary, or that somehow don’t quite fit, so we got excited when Klaus enthusiastically told us the Beissel story. It seemed like a natural choice to pick one of his hymns and use it as the basic scaffolding for a collective composition. When it came to makIng the piece you hear on the record, we decided to adopt a loose algorithmic system of our own, that would dictate the arrangement / orchestration, dynamic movement, harmonic density, harmonicity, etc of the chosen hymn. We decided that we would like to record a version a little over 45 minutes long, and this length we achieved simply by dilating the time it should ordinarily take to play through the hymn (by a factor of 20 or 30 times). So I guess you could say the piece on the CD is sort of like a 21st century re-imagining of his music and working processes.